I love the base of this recipe but when made as is, it was too thin and stiff from too much spinach. I made it as written the first time and ended up with a very stiff, thin, dry spinach pie. I have continued to use this recipe so to speak, but have since used 5 large eggs, only about 1/2 to 2/3 of the spinach called for, chopped bell peppers and 1/4 cup milk, and only 2 cups of cheese (I usually use cheddar). Other add-ins I have used with fantastic results - 1/2 cup cottage cheese in place of cheese, 1/2 cooked chopped bacon or ham, 1 can diced green chilies, chopped sun dried tomatoes, 1/4 cup crumbled blue cheese or feta, mushrooms (saute first), or caramelized onions. I usually assemble this the night before and just pop it in the oven the next morning. With extra eggs and milk, I add about 4-5 min. of cooking time. Also, no need to saute spinach. I just drain and squeeze it dry before throwing into the egg mixture. If using onions, sauteeing is a must. 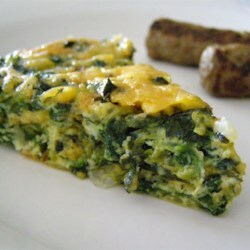 With more eggs and some milk, you get a slightly thicker, more moist and tender quiche. You will never miss the crust it's so good.